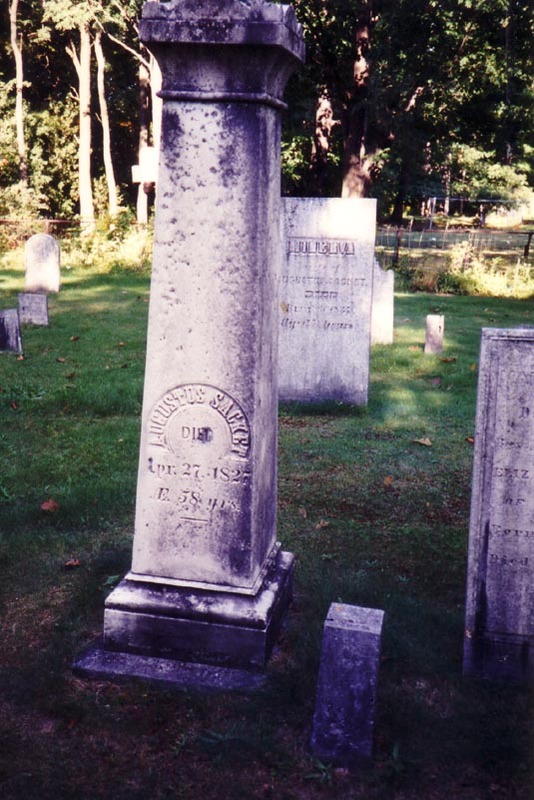 Augustus Sacket, lawyer, soldier, businessman, founder of the village of Sackets Harbor, son of Samuel Sackett and Mary Betts, was born in New York CityG on 10 November 1769.1 He died aged 57 in Albany, New York StateG, on 22 April 18271,2 and was buried at Lakeside Cemetery, Sacket's Harbor, Jefferson County, New York StateG. He married in Catskill, New York StateG, on 19 January 1795, Minerva Camp.1 She was born in 1780.3 She died aged about 57 in 18373 and was buried at Lakeside Cemetery, Sacket's HarborG. Augustus Sacket, a New York lawyer and businessman, achieved fame when he acquired substantial tracts of unimproved land on the south-east shore of the inland sea of Lake Ontario and founded what was to become the flourishing and strategically-important village of Sackets Harbor. In the years after the Revolution, New England Yankees viewed the forests and waterways of western New York state with a keen eye for settlement. In 1801, New York City land speculator Augustus Sacket travelled to Lake Ontario to verify reports of a naturally sheltered harbor on Black River Bay. Upon seeing the harbor, he became enthused with its potential: “There a harbor is found which is sheltered from the winds and surges of the Lake. A peninsula of limestone rock perfectly protects a sheet of water covering about ten acres.” The harbor was deep enough to accommodate boats of any size and close enough to the busy St Lawrence and Black Rivers to make it a convenient port of trade. He purchased all the surrounding land and began to build a new community. “The flourishing state of Mr Sacket’s village, its advantages of water carriage, and its valuable fishery, render it one of the most inviting objects to an industrious settler.” For his own family, Augustus built a splendid Palladian-style villa. 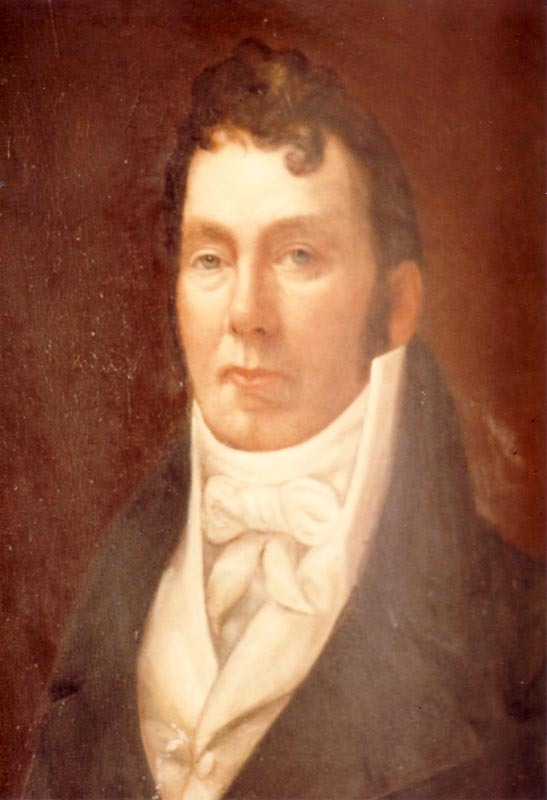 In 1805, Augustus became first Collector when the portion of the State bordering Lake Ontario became a US Revenue District and, in 1806, was elected the first Supervisor of the town of Houndsville which embraced the village and port of Sackets Harbor. He became the first County Judge when Jefferson County was organized in 1807. He was also Captain of State troops. The strategic importance of Sackets Harbor was to become apparent during the War of 1812, when it was made the Headquarters of the Northern Army and Fleet. The town was successfully defended twice against attacks by English fleets. But Augustus Sacket had, in 1809, sold his holdings in Jefferson County and moved to Jamaica, Long Island. He moved again, in 1812, to Meadville, Pennyslvania, returning shortly after to his birthplace, New York City. He returned to Sackets Harbor sometime after 1820 when he became interested in the islands of the St Lawrence. His last home was Newburgh, Orange County, New York, and it was while traveling from there to Sackets Harbor that he died on 22 April 1827. Augustus Sackett was born in New York City. He there acquired his education, studied law and began the practice of his profession. He was also interested in a mercantile business there, and at same time invested largely in unimproved real estate located mainly on and near the eastern shore of Lake Ontario. One purchase, in which he was interested equally with John W. Watkins, a noted real estate speculator of the period, contained fifteen thousand acres; a second tract purchased on his own account contained sixteen thousand five hundred acres, and a third, one half of the township of Houndsfield. He took a lively interest in local military affairs, holding commissions as Lieutenant, Lieutenant Captain, and Captain of State troops. In 1801 he disposed of his business interests in New York City and removed to his Lake Ontario estate. He there began a settlement on Black River bay since known as Sacketts Harbor. The founding of that village, by which his name was to be perpetuated, was begun with energy and prosecuted with success. In 1804 his brother-in-law, Elisha Camp, of Catskill, N. Y., joined him, bringing additional capital and energy to the undertaking. In 1805 a considerable company of English colonists of the better class were induced to settle there, and the same year the General Government organized all that portion of the State bordering on Lake Ontario into a United States Revenue District, and Mr.. Sackett was appointed its first Collector. In 1806 the town of Houndsfield, which embraced the village and port of entry of Sacketts harbor, held its first town meeting and elected Mr. Sackett its first supervisor. In 1807 Jefferson County organized with Mr.. Sackett as its first County Judge. Two years later Judge Sackett disposed of all his holdings in Jefferson County, mainly to his brother-in-law, Elisha Camp, and removed to Jamaica on Long Island. During the War of 1812 Sacketts Harbor was made the Headquarters of the Northern Army and Fleet. Several was vessels were built there and the town was twice unsuccessfully attacked by English fleets. It is still a port of entry, but retains little of the commercial and military importance of the period mentioned. Died at Albany, on Sunday last, Augustus Sackett, Esq., formerly of Sackett's Harbor, but late of Newburgh, in the 59th year of his age. Charles Weygant, The Sacketts of America, "307. Augustus Sackett, b. Nov. 10, 1769, d. Apr. 12 [sic: Apr 22], 1827; m. Minerva Camp." Website Death Notices from the New York Evening Post, 1801–1890 (New England Historic Genealogical Society) (http://www.NewEnglandAncestors.org), 4/26/1827. "Albany, Augustus Sackett, 59." 1790 US census, digital image from National Archives microfilm, Ancestry.com, Augustus Sackett. New York City Dock Ward, New York, NY. 2 white males (16+).